Switching topics from the once again fugly F1 car designs lets take a look at the other design aspect that will certainly change this year, the driver's helmet designs incorporating their career numbers. I'll try to update this as the drivers reveal them at least for the start of the season because I'm sure they'll change a lot for races like Monaco and wherever the driver sees fit (Seb for example is notorious for this). First up Jalop favorite and professional mumbler Kimi"IKnowWhatImDoing"Raikonnen. I like how he flipped the seven in the above picture, but do hate how the Weichai wording is within the number (Are the chinese now trying to learn Firey engine tech from the italians?). That top is rather normal Kimi, with that symbol being in previous design. Anybody know what it represents? Fernando Alonso's helmet is a bit more "traditional" as he keeps his color scheme. His number is simply plastered on top like an after thought. 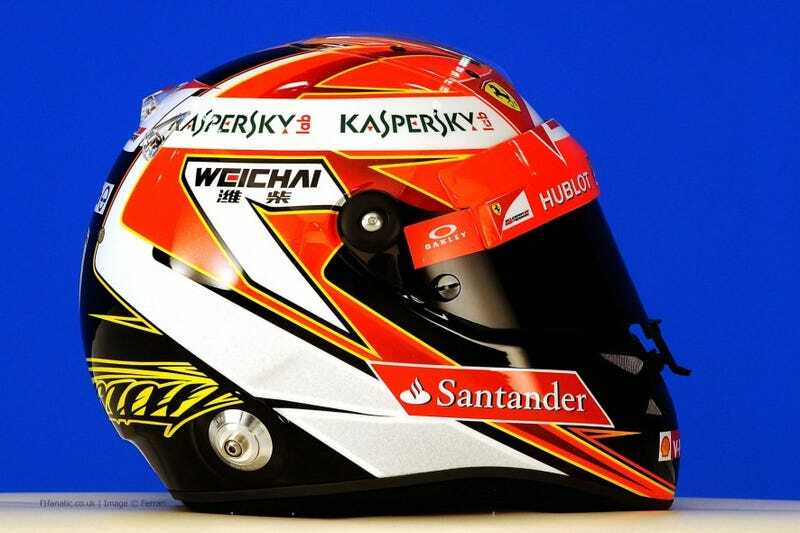 Here is the first of many Helttels/Vettmets (Sebastian Vettel Helmet's). I expect him to at least have 6 throughout the year. I think he should have been a bit more creative and plastered that number one in a foam finger outline or have the number one be the number sticking up. Daniel Ricciardo's Helmet features a honey badger (the animal not the riffle) stating, "what would he do?" I'm assuming that flower on [Kamui] Kobayashi's helmet is some kind of Japanese tribute or it's his way of expressing his love to his fans, specially those who where able to donate for his seat. Wait, did Oppo's FOR SWEDEN design design this helmet (though it might be lacking some Viking horns)? Well, I'm sure he's glad the grid got some Swede back.